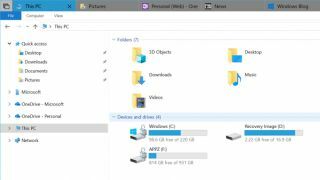 Windows has undergone huge changes over the last few years, but the trusty File Explorer has remained virtually untouched. Whenever you want to drag and drop files between locations outside your Quick Access panel, you have to open two File Explorer windows. It's frustrating and, frankly, a waste of effort. That's all changing with the introduction of a feature called Sets, which lets you group together all the apps you need for a particular task into a single tabbed window. This means you can finally have multiple File Explorer windows open in separate tabs, making moving files and folders effortless. Sets were originally planned as part of the Windows 10 Redstone 4 update (expected for release very soon), but have now been pushed back to Redstone 5, which will be released later in the year. Sets currently work with File Explorer, Notepad, Command Prompt and PowerShell, but Microsoft is planning to expand it to more Windows 10 apps soon, including Edge, Mail and OneNote. The ultimate goal is for you to be able to gather all the programs you need for a particular job in a single window. For example, if you're researching a project, you could have several browser tabs open, plus Microsoft Word, making it easy to switch between them. You can test Sets right now (including File Explorer tabs) by downloading Preview Build 17618, which is available for users in the Skip Ahead version of the Windows Insider Fast Ring. The Windows Insider Program is open to anyone, and lets you try new features and give feedback to Microsoft by downloading preview builds of Windows. Previews are released to different Rings (Fast, Slow or Release), depending on how far along they are in testing and development. Previews released to the Fast Ring are in the earliest stage of development, and might be unstable or contain bugs, so it's important not to use one for everyday work. Microsoft has published a step-by-step guide to help you get started. Don't fancy testing unfinished, potentially wobbly versions of Windows? Last month, we heard that Microsoft might make preview versions of its main apps available to people outside the Windows Insider program. It's not clear exactly how these previews will work, but according to Brandon LeBlanc, senior programmer on the Windows Insider team, they'll be an easy way for any Windows user to test new apps before their final release.